With Mt. Adams as a backdrop, Trout Lake Marsh is a beautiful birding destination near the west edge of the East Cascades ecoregion, not far from the Cascade crest. This landscape features a complex ecosystem where forested uplands meet freshwater wetlands, creating an ecologically rich habitat at 1,900 feet. Trout Lake Creek, the primary watershed situated northeast of Indian Heaven Wilderness, meanders through this valley and is a key contributor to the wet conditions found here. Willows, alders, and cottonwoods dominate the vegetative communities in and around the marsh. Firs, pines, hemlock, cedar, and larch comprise the surrounding forest, with a deciduous understory including ocean spray and vine maple. From White Salmon, take Route 141 north to Trout Lake. Park at Mt. Adams Ranger Station. Walk west to Lake Road, and follow this gravel road to the trailhead. The trail is about .75 mile one way, with benches provided. 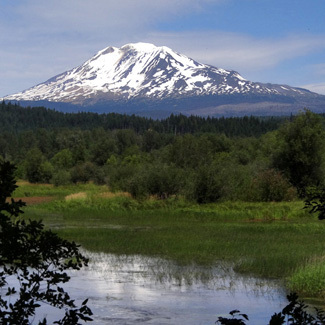 This property is protected by the Washington Department of Natural Resources as the Trout Lake Natural Area Preserve.